What surprises me is that Gera developments are a 5 decade old player in the Pune market and people are upset with this township project. 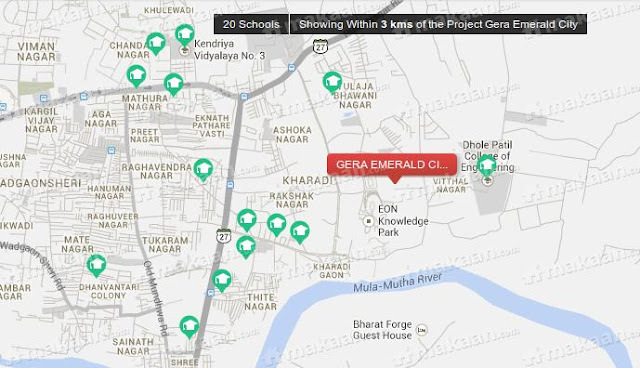 Located in Khardi in the eastern corridor of Pune, Gera's Emerald City is ready for possession. Let's get into the details to figure out if the claims are really true. We have time and again stressed about Khardi as a popular upcoming destination in Pune. It gained strategic importance due to the EON Free Zone Special Economic Zone. The site is located in Residential Zone under Development Plan which gives it a special advantage. There are schools, a PMT bus stop, ATM facilities, convenient grocery shops within the radius of 1.5 km from the site. Well, known schools & colleges like Symbiosis International School, Vibgyor International School, Dhole Patil College of Engineering add to the location value. Prominent malls like Phoenix Market City Mall, Inorbit Mall, Amanora Town Center in the vicinity ensure your shopping needs are taken care off. Overall the location is a winner. The layout plan is good but it doesn't excite us here. A few apartments will have views of their neighbours homes which is disappointing. Rest most of the amenities are well planned so this master plan is a mixed bag. It's critical for you to see which apartment you are getting, please be careful and choose the right product. It's an investment for a lifetime don’t go wrong with it. The apartment comes with an entrance foyer which ensures privacy in the apartment. Each living room has a segregated family space & opens onto a terrace. Vitrified flooring is used across the living dining space. One interesting thing the developer has done is to give a choice of open-plan and close plan kitchen. The apartment comes with a 3-fixture bathrooms with premium sanitary ware and fittings. Another good thing is that the apartment comes with a generator backup of 0.75 KW per flat. Almost every apartment is open from all 4 sides to allow natural light and ventilation within the apartments. The room sizes are spacious and roomy. 2. Delayed Possession, not acceptable. 3. Poor quality finish. Customers have been complaining of leakages in parking lots and penthouses further affecting lifts within a month from possession. 4. Passages on all floors fill up with water as there is no proper slope to drain out rain water. The location is good, amenities and plans are good however the developer needs to look into customer complaints at the earliest.